Lighting the Way works to mobilize East African diaspora youth to empower their counterparts in the Horn of Africa by making education more accessible. With an important message and cause, the site needed visuals to match. 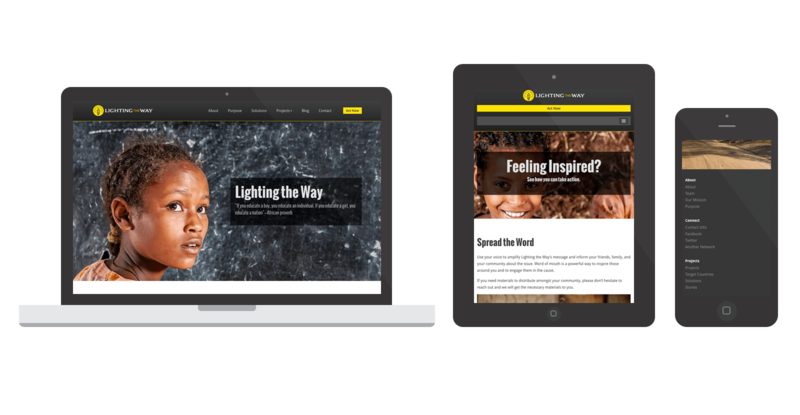 Lighting the Way contacted Spark Logix Studios, looking to have a new site built for their brand new charitable organization. Their cause and message was and is youth centric, helping provide educational opportunities for children (specifically girls) in the horn of Africa. The site design needed to be something engaging and non-traditional. Something very modern and cutting edge. Spark Logix Studios was more than up to the task. Web design trends have swung heavily in the direction of simple, clear, and extremely visual presentations. Our designers spent a long time finding the perfect images to use, to compliment the messaging while still remaining beautiful, and fitting within the color scheme we carefully chose. Visitors are able to quickly understand what the site is, the purpose of the charity, and understand how to get involved, all while enjoying a visually gorgeous website. Another great design, brought to you by Spark Logix Studios!